The Fourth Assembly of the World Council of Churches has concluded. Theologians departed frustrated. No real solution to the nagging problems of Church Unity. Why? This eyewitness report uncovers the real causes! IT WAS the fourth attempt in recent years to further the cause of Christian Unity. Delegates from 232 member churches — Protestant and Orthodox — in 80 countries were present. Roman Catholics were represented by a 15-man non-voting delegation of observers. Very few analysts understand today's worldwide drive to unite the Churches under one banner. Still fewer can answer the question: How did today's Christianity become so hopelessly divided? The theme of the Fourth Assembly was, "Behold, I make all things new." It was taken from Revelation 21:5. But the opening session of the World Council of Churches (WCC) revealed that many of the delegates hadn't yet caught the spirit of the word "new." Numerous dignified churchmen were dressed in garbs out of fashion since the Middle Ages! Six main issues or topics confronted the assembled delegates. 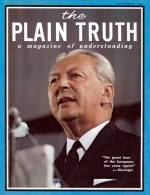 The first issue was "The Church's Unity in a Shrinking World." Theologians battled "the question of the Church's unity in relation to the Churches' DIVERSITY of teaching, worship and witness." Dr. Eugene Carson Blake, Secretary General of the WCC, told me later that he personally was very optimistic regarding the prospects of the Churches being united in our time. He called the Fourth Assembly of the WCC the most widely representative meeting of Christian Churches in over 900 years." But it became abundantly clear, during the course of the meetings, that real Christian unity is not just around the corner. The Churches remain hopelessly divided on many points. Nothing highlighted the differences of doctrines and customs of the 232 member churches so much as an eye-popping BBC TV documentary which was shown to all in attendance during the first week of the meetings. This film entitled "Christ and Disorder" concerned the important question: "Why so many Churches?" This BBC TV documentary was not filmed or edited by the WCC. Its candid shots included the dress, customs and practices of today's divided Christianity. Church functionaries were shown practicing sprinkling, pouring or immersing — all divided as to the form of Church baptism. Many attending the WCC Conference in Uppsala shook their heads in disbelief — sometimes in disgust — at some of the practices of professing Christians as revealed by this candid British TV documentary. Occasionally delegates actually broke out in laughter when they saw in the film some of the ridiculous practices, customs and beliefs of today's Churchianity. This BBC TV documentary was an eye-opener — even for the theologians! Even between sessions every delegate or observer at the WCC meetings was constantly reminded of the diversity of dress, customs and beliefs among the various Churches assembled at the meetings. One of the most colorful dignitaries attending the WCC was Dr. Michael Ramsey — Archbishop of Canterbury, and one of the WCC'S six presidents. I met Dr. Ramsey for the first time at this Fourth Assembly of the WCC. Dr. Ramsey has been foremost among Protestants in seeking to bring about religious unity. He has tried to bring the Anglican and Roman Catholic Churches closer together. In early 1966, the Archbishop of Canterbury went to Rome to meet Pope Paul VI — in order to further the cause of Christian unity. At that historic meeting with the Pope, he said "I have come [to Rome] with the longing in my heart... May the grace of God enable us to serve His divine purpose by our meeting and enable Christians everywhere to feel the pain of their DIVISIONS and seek UNITY and truth and holiness." In replying to the Archbishop of Canterbury, the Pope responded: "You rebuild a bridge, which for centuries has lain fallen between the Church of Rome and the [Anglican] Church of Canterbury." Dr. Ramsey then added: "In the field of DOCTRINE and ecclesiastical law, we are still respectively DISTINCT and DISTANT..."
On departing, the Archbishop and the Pope embraced. Very few commentators grasp the significance of the Catholic Churches bid to woo Protestants back into the Roman fold! Referring to the Anglican Church, the Pope has made the following significant statement: The Anglican Church is "a Church which she [the Roman Catholic Church] has loved so much and to which, one might say, SHE GAVE BIRTH!" The Catholic Church "gave birth" to the Anglican Church? In the eyes of Roman Catholics, yes. The Roman Catholic Church repeatedly speaks of herself as the "Mother" of the Protestant movement. "The MOTHER CHURCH of Christendom lovingly invites the descendants of all the CHILDREN torn from her bosom by irrelevant issues to return to the practice of their forebears [meaning the Roman Catholic Church]..." (90 Common Questions about the Catholic Faith, by John O'Brien, p. 11). It is also an interesting fact that the founders of many traditional Protestant Churches were either trained to become Catholic priests or were ministers in one of her Protestant daughter-churches! Roman Catholics have pressed this relationship because they believe no Church Unity will ever take place among Protestants apart from Rome. Today's Church-unity drive (the Ecumenical Movement) is only one of man's vain attempts to unify a very divided — and divisive — humanity. Everybody senses the need for one world — but nobody, it seems, knows how to achieve it. Ever since the Tower of Babel, the nations of the earth have tried to unite POLITICALLY. In this century the League of Nations tried — but failed. Now it is the dis-United Nations. No one has grasped the simple cause of disunity. The cause is HUMAN NATURE. So long as human beings possess human nature — whether politicians, theologians or laymen — there will never be unity, or peace! Not until human nature is changed will church unity be possible. But the way to change human nature seems to have eluded world leaders and world thinkers. Human beings resent anyone telling them what to do — especially God! Yet the God who put human nature into man is the ONLY ONE who has the power to change human nature. What a paradox! How long must human beings suffer from their own stubborn ways before they learn that obedience to God is the way to peace, to happiness, to unity, to joy brimful and running over? When will theologians discover that?